I’ve been working on developing some new patterns. I’ve been wanting to create a pattern for the internal flex frames we have in the shop. I wanted to add a bit of patchwork to my design, as well. 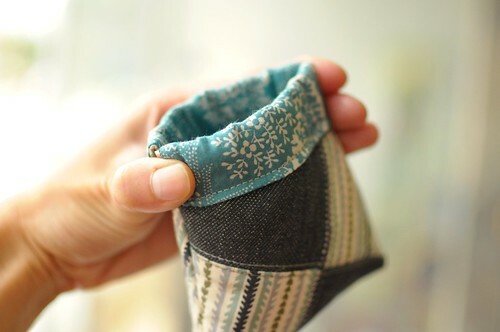 My first version was a little coin purse with a pinwheel inspired pattern. It’s pretty sweet. My second version was inspired by my need for a case for my new sunglasses. I have a terrible habit of just throwing my sunglasses into my bag and getting them scratched up. This is why I never buy expensive sunglasses. My new pair was $20 on sale, but I’m trying to mend my careless ways. 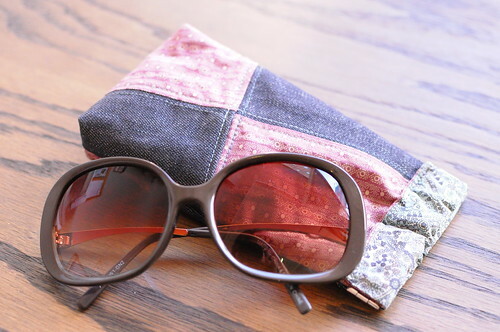 I made up a longer pinch pouch that is the perfect size to hold a pair of eyeglasses. yay! This project is quick & fun to sew. A little bit of patchwork, some quilting, insert a lining, insert a flex frame and voila! 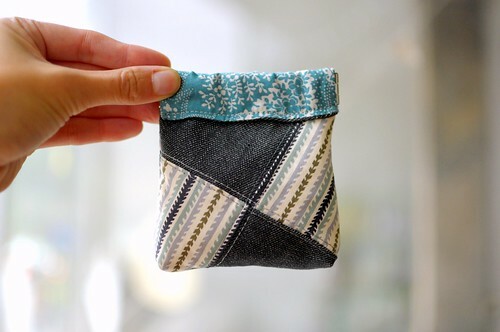 Patchwork Pinch Pouch. Perfect for holiday gift making. and for saving sunglasses. thanks for the pattern!!! so helpful. i have been looking for little christmas present ideas. This would be perfect for transit tokens!